Well April sure is off to a great start. Of course much of that has to do with the fact that I was working days and thus able to follow the markets closely. That allowed me to be more aggressive with my opening and closing of positions since I could see how things were playing out each day. My option activity level is likely to slow down for the remainder of the month now that I'm back to working nights, but there's still a lot on deck that I'm excited to see play out. 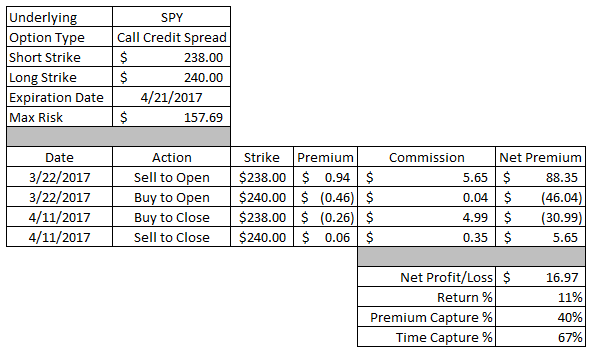 Without further ado here are the option moves that I made for the week of April 10-13. One of my go to strategies whenever I take assignment of shares, especially if I don't want to own the shares for the long-term, is the covered strangle. The covered strangle is created by owning 100 shares and then selling both a put option and a call option. Since the price of SLV is relatively low at ~$17 I don't mind doubling up my position in exchange for improving my effective sales price to the upside. I acquired my shares of SLV via a cash secured put within my Rollover IRA. My effective purchase price, the strike price less the commission received, was $17.18. I sold both a $17 strike put and call option because there just wasn't enough premium to go further out of the money with the strike prices. I received a total credit of $88.90 for selling both options. If SLV's share price is above $17 at expiration then I'll have to sell my 100 shares at an effective sales price of $17.89. That would be an excellent 4.13% return compared to my $17.18 cost basis and would give a 46.0% annualized return through expiration. If SLV's share price is below $17 at expiration then I'll have to purchase 100 additional shares at an effective purchase price of $16.11 which is about a 4.4% discount to the current price. That would reduce my average cost basis for the position to $16.65 or a 3.1% reduction. I don't expect to do much management with this position unless an opportunity opens up early in the cycle to where I can lock in a significant profit and reestablish a new position at more favorable terms. 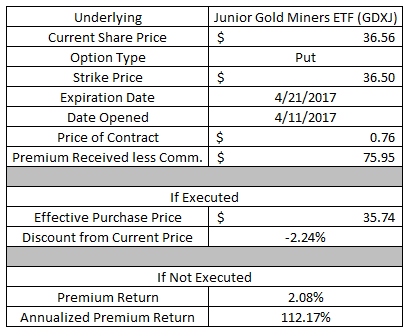 If you've been following along with my various option moves I've routinely circled back to the Junior Gold Miners ETF to generate option premiums. While this is far from a position that I would want to own for the long term I also want to take advantage of opportunities as I see them and GDXJ typically has rich option premiums that can yield excellent returns. 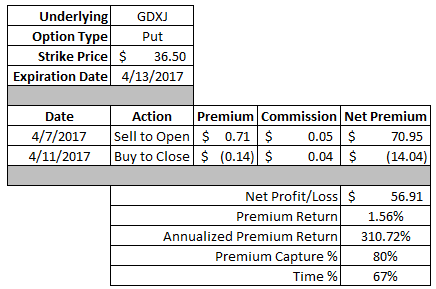 If GDXJ's share price is below $36.50 at expiration then I'll have to purchase 100 shares of the ETF. My effective purchase price would be $35.74 which is about a 2.2% discount from where shares were trading at the time the position was opened. 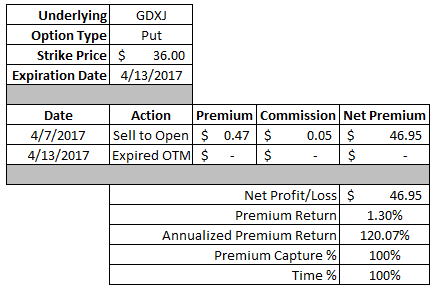 If GDXJ's share price is above $36.50 at expiration then I'll get to keep the full option premium as profit. The $75.95 option premium would be a 2.08% return on the $3,650 in capital securing the contract. Through expiration that would be a 112% annualized return. 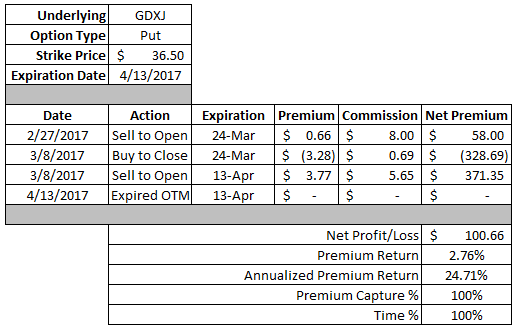 Ideally GDXJ's share price would remain above $36.50 allowing the contract to just expire OTM. However, should GDXJ's share price fall below then I will look to roll the position out in time and collect additional credits for doing so. After writing 2 put contracts in an attempt to get shares of Colgate Palmolive put to me prior to the ex-div date I had to go a different route. So I went with a buy/write where you purchase 100 shares of a company and simultaneously sell a call option against those shares. I purchased 100 shares of Colgate-Palmolive for $73.74 per share. I'm not thrilled with that valuation so I wanted to do something that would immediately give me an opportunity to reduce my cost basis by selling a covered call. If Colgate-Palmolive's share price is above $74 at expiration then I'll have to sell my shares at an effective sales price of $74.69. That would be a decent 1.29% return in about 1.5 weeks. 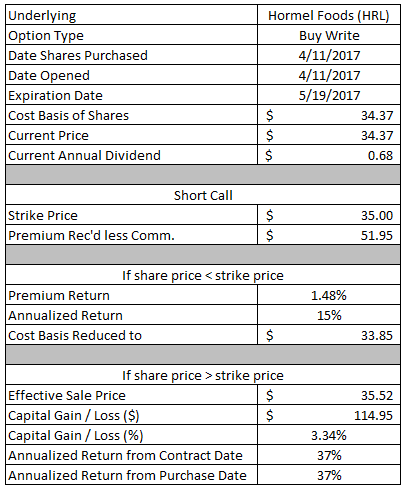 Keep in mind that I purchased the shares prior to the 4/19 ex-div date so I'll also be entitled to the next dividend payment of $0.40. If Colgate-Palmolive's share price is below $74 at expiration then I would have effectively reduced my cost basis by the $68.95 option premium. That would lower my cost basis for this position to $73.05. Since the valuation, in my opinion, is a bit stretched I will be looking to aggressively sell call options should this contract expire OTM. The good thing is that Colgate-Palmolive is set to announce earnings late next week which will give me an opportunity to sell another call option that carries a bit more premium. Since I don't want to own Colgate-Palmolive at this initial valuation I'll look to sell a $73 or $73.50 strike call option which is currently being priced at $1.85 and $1.63, respectively. This trade was similar to the Colgate-Palmolive buy/write in set up; however, I'm more comfortable owning shares of Hormel at this level. I purchased 100 shares of Hormel Foods for $34.37 per share. As I mentioned earlier the valuation is decent at this level which equates to a 20.6x P/E for 2016 and 20.3x P/E for 2017's estimates. If Hormel's share price is above $35 at expiration then I'll have to sell my shares at an effective sale price of $35.52. That would be a solid 3.3% return in about 5.5 weeks or 37% annualized. Plus I'm also entitled to the next dividend payment of $0.17 so that's a nice little bonus. If Hormel's share price is below $35 at expiration then I would have effectively reduced my cost basis by the premium received. That would reduce my purchase price to $33.85. Over the last couple weeks I've been experimenting with various defined risk strategies to see what ways I can improve the efficiency of my capital. One of the strategies has been the vertical spreads which entails selling an OTM option and buying a further OTM option. Since you're selling an option that is closer to being ITM this is done for a net credit that represents the most you can make on the trade. However, it also means that you know going into the trade the most you could potentially lose. The put credit spread is a bullish to neutral strategy. Essentially you want the underlying to move higher or to just sit tight while you let time eat away at the option prices. By opening this position I received a net credit after commission of $61.91. Since the spread, the distance between the two strikes, is $4.00 the most I can lose on this trade is $338.09. The maximum profit will be achieved if SPY is trading above $228 at expiration. If that happens both options would be OTM and I'll get to keep the full option premium as profit. The $61.91 in credit would represent a 15.5% return on the $4.00 width of the spread. The maximum risk would be seen if SPY is trading below the $224 strike of the long put option. If that happens the spread would be trading for $4.00 to close; however, I already received the $61.91 credit so my net loss would be $338.09. I already have 1 put option open on Qualcomm; however, that one isn't looking all that great barring a big move back higher after earnings are released later this week. So in order to do a bit of preemptive defense I sold another put option with at a lower strike price expiring just one week later. 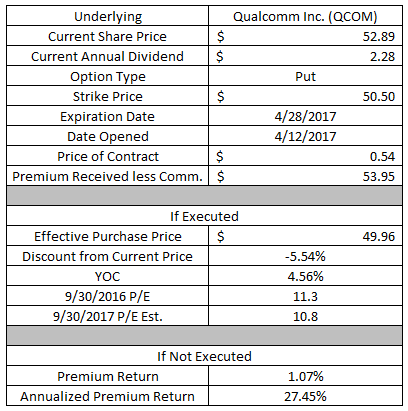 If Qualcomm's share price falls below $50.50 at expiration then I'll have to purchase 100 shares at an effective purchase price of $49.96. That would be at around a 5.5% discount from the current share price. The valuation looks compelling at that level with an 11.3x P/E for 2016's earnings and a 10.8x based on the estimates for the current fiscal year. The YOC would be a hefty 4.56%. If Qualcomm's share price remains above $50.50 then I'll get to keep the full option premium as profit. The $53.95 in option premium would be 1.07% return on the $5,050 of capital securing the contract or a 27.5% annualized return. This was another attempt at branching out into new products as well as new, well new-er, strategies. Similar to the gold miner ETF's the Gold Trust carries a higher implied volatility which means richer option premiums. By opening this position I received a net credit after commission of $39.00. Since the spread, the distance between the two strikes, is $2.00 the most I can lose on this trade is $161.00. The maximum profit will be achieved if GLD is trading above $118 at expiration. If that happens both options would be OTM and I'll get to keep the full option premium as profit. The $39 in credit would represent a 19.5% return on the $2.00 width of the spread. The maximum risk would be seen if GLD is trading below the $116 strike of the long put option. If that happens the spread would be trading for $2.00 to close; however, I already received the $39 credit so my net loss would be $161.00. This put option worked out nicely all things considered. 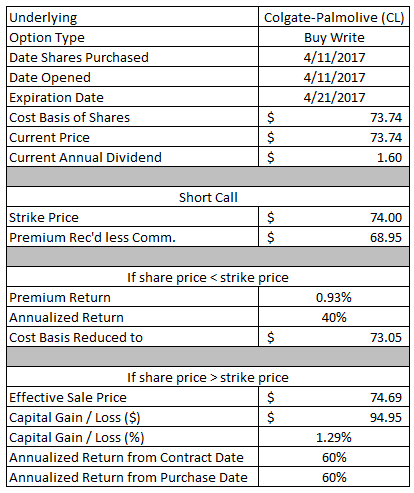 I took advantage of some weakness in Union Pacific's share price towards then end of March to open another put option, but the time had come to close it out and lock in a profit. This option position produced a total profit of $51.91. That's a decent 0.50% return on the $10,400 of capital securing the contract. On an annualized basis that's equivalent to a 19.9% return. I was able to capture 67% of the maximum profit in just 48% of the days until expiration. While I would prefer to let things run all the way until expiration in order to capture the full option premium; the problem is that sometimes that's not the best move. Colgate's share price had been hovering semi-close to my strike which meant it was a no-brainer move to close this out for a solid profit. Of course the other reason is to be more efficient with my capital. If I left this position on, even though it was just a few more days until expiration, that's $7,250 of capital that could have only produced another $13 in profits. In other words there's better investment prospects out there. This put option generated a net profit of $54.91. Based on the $7,250 of capital securing the position that's a 0.76% return in about 1.5 weeks. That equates to an annualized return of 31.7%. I was able to capture 81% of the maximum profit in 77% of the days until expiration. Whenever I open an option position I typically go straight to set up a good til cancelled order at certain profit targets. That works out great whenever I don't have time to be following the markets; however, sometimes it doesn't work out if the underlying makes a big move in my direction. The call credit spread is a neutral to bearish position and unfortunately for this position the S&P 500 made a sharp down move and I left some money on the table by having the GTC order in. I can't complain though because a profit is a profit is a profit. This call credit spread produced a net profit of $16.97. That might not sound like much; however, you have to keep in mind that since this was a defined risk trade the capital at risk was just $157.69. Despite leaving some profit potential on the table this option play produced an 11% return on the capital at risk. This position took a while to work out, but I'm more than happy with the results. 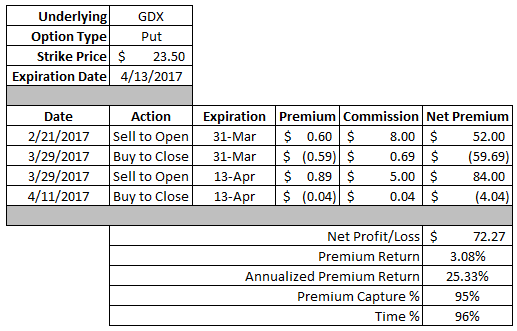 I originally sold a put on GDX back in late February and had to roll it out in time by the end of March after gold had taken a dip. GDX has since rallied and was sitting just slightly higher than my strike price last week so the prudent move was to close out the position instead of taking on the risk of a couple extra days. After accounting for the original credit and the additional credit from rolling the option out in time, this position produced a net profit of $72.27. Since this put option required $2,350 in capital to secure the contract that equates to a 3.08% return in just under 2 months. Even after extending the duration of the trade that's a solid 25.3% annualized return. I was able to capture 95% of the maximum profit in 96% of the days until expiration. Over the last few weeks I've been experimenting with selling short dated ATM or just slightly OTM puts on the Junior Gold Miners ETF. Even with such little time until expiration, typically around 1 week, there's still plenty of juice in the option premium due to the high implied volatility that comes with gold related investment products. This put option generated a net profit of $56.91 via option premium. 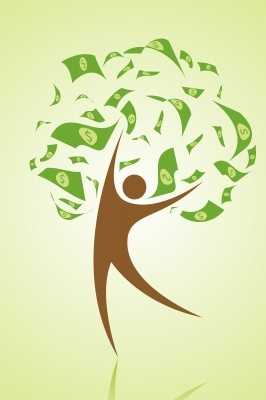 Based on the $3,650 of capital securing the contract that's an excellent 1.56% return. Since that return was earned in less than a weeks time the annualized return doesn't give an accurate representation; however, it does work out to over a 310% rate of return. I was able to capture 80% of the maximum profit in just 67% of the days until expiration. This call option was originally part of a covered strangle I had opened on CVS back in mid-March. CVS' share price had since moved lower. Ideally I would have been able to close the covered strangle at a profit, but there wasn't any real opportunity since the share price had dipped below the strike of the short put part of the covered strangle. I rolled the put portion of the covered strangle out in time, which I'll discuss later, and allowed the call portion to just expire OTM. Since this call option expired OTM, I was able to keep the full option credit as profit. 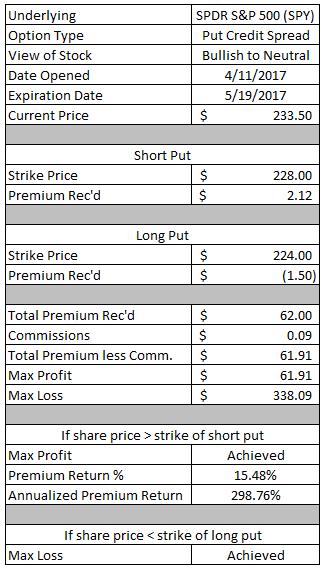 The $31.95 in option premium represents a 0.38% return on the $8,350 strike of the call option. That's a decent 4.6% annualized return. This was another one of those short dated slightly OTM put options that I've been trying with GDXJ. With gold's move higher last week this worked out perfectly and I was able to let the contract expire OTM and keep the full option premium as profit. The $46.95 in net profits amounted to a 1.30% return on the $3,600 in capital securing the contract. Since that was earned in just 1 weeks time that's a huge 120% annualized return, of course I don't expect that to be typical of my option trades. Johnson & Johnson share price had seen a fairly substantial move higher over the last few weeks. 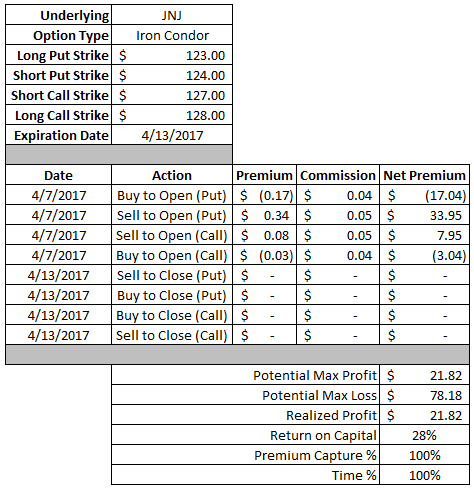 With earnings upcoming I decided to take a neutral stance on Johnson & Johnson by selling an iron condor. 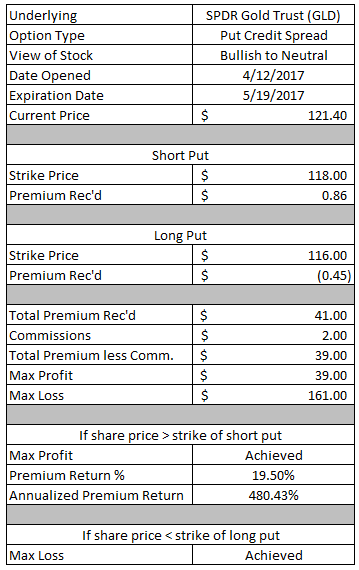 Since Johnson & Johnson's share price remained between the 2 short strikes, $124 and $127, all 4 contracts expired OTM. When I opened the position I received a net credit of $21.82. Since both spreads were $1.00 wide that meant the maximum risk/loss was $78.18. This iron condor generated an excellent 28% return on the maximum risk in just 1 weeks time. Similar to my GDX option that I mentioned earlier, this position took a while to play out. It wasn't long after I sold this put option that gold dipped lower bringing GDXJ's price down with it. That meant I either had to take the shares which I would have been fine with or rolling the position out in time. Since rolling it out GDXJ's share price had recovered and ended up higher than my strike price meaning it was finally set up to expire. This put option produced a net profit of $100.66. That's a solid 2.76% return on the $3,650 in capital securing the contract. Despite having to extend the duration of this trade that still works out to an excellent 24.7% annualized return. This is the other portion of the covered strangle that I had originally opened up on CVS. The call portion expired OTM, but the put option needed to be addressed. I could have just let things play out, but decided to take the chance to roll the position out in time before potentially taking the shares. And doing so for an additional credit is just fine by me. My original breakeven point was $77.82. With CVS' share price trading below that and expiration fast approaching it made sense to roll the position out in time in order to collect additional credits and improve my breakeven. I was able to collect an additional $0.85 in option premium by extending the duration of the trade by 2 weeks. Surprisingly enough that's more credit than I received on the original position, of course that happens when you go from selling an OTM put to rolling it out once it's ITM. The additional option premium received on the roll reduces my breakeven point to $76.97 or 1.1% lower. If CVS' share price is above $78.50 at expiration then I'll get to keep the full option premium as profit. The $152.86 in option premium would be a 1.95% return on the $7,850 in capital securing the contract. There's also another potential roll should CVS continue to hover around my strike price or even move slightly lower. 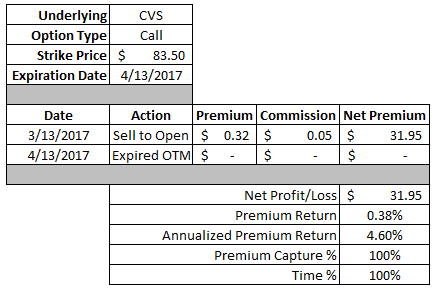 CVS is scheduled to report earnings on May 2nd which means higher implied volatility and richer option premiums. As the option markets currently stand I could roll out this put option just 1 more week and collect an additional $0.80 per share in option premium. Typically I only make defensive moves with my positions; however, I saw an opportunity to make an offensive move that improved things substantially. I originally bought 100 shares of Visa and simultaneously sold a call option against those shares with the original intent being to let the shares get called away should the call option be ITM. 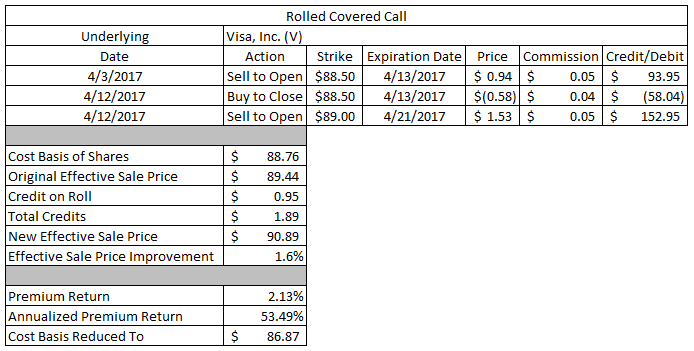 However, I decided to make the offensive move by rolling my call option up in strike and out in time by just 1 additional week to take advantage of the higher implied volatility related to Visa's upcoming earnings release. With the richer option premiums related to earnings I was able to move my strike price higher by $0.50 while simultaneously collecting a hefty credit to do so. The cost basis of my shares was $88.76. If the original covered call had been ITM then my effective sale price would have been $89.44 or around a 0.77% potential profit. However, with the additional $0.95 in option premium as well as the $0.50 in strike price improvement this trade looks even better. My new effective sale price is increased to $90.89 representing a 2.40% potential gain to the upside. If Visa's share price is below the $89 strike at expiration then I'll get to keep the full option premium as profit. 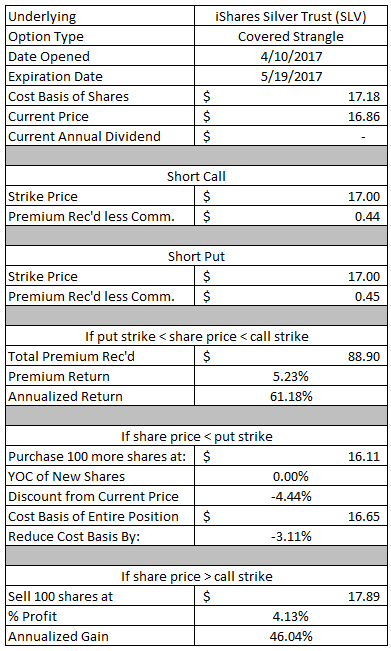 The $188.86 in option premium would be a 2.13% return based on the $89 strike of the call option. The option premium would reduce my cost basis from $88.76 to $86.87. Through the first 2 weeks of April I don't think I could be much happier with the results from my options trading. Thus far I've locked in $908.40 in option profits. That's essentially the same as what I was able to make in all of March. Year to date I've generated $4,975.15 in option profits. April has the potential to be my best month of options trading. The rest of my open April positions have the potential to produce nearly $1,150 in option profits should everything expire OTM. Of course I don't expect that to be the case and would be happy if I can collect at least 50% of the potential remaining profits. Although I can also expect to collect some of the potential $2,687.83 in profits with my positions that are currently set to expire in May which should help things out as well. All in all I'm happy with the results through the first 2 weeks and change of April. Do you use a subscription service for options or do you pour over the tables yourself looking for good opportunities?